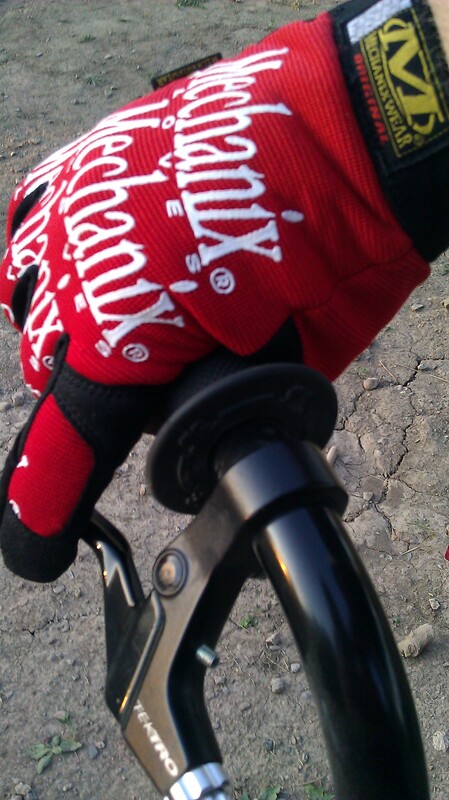 While not made with cycling in mind, I have been noticing that a lot of riders have been singing the praises of Mechanix gloves on different forums and websites. So I decided to put them to the test. Mechanix gloves, if you’re not familar with them, are an all-round glove made for mechanics. They’re designed to be durable but still thin enough to afford mechanics the ability to work on machinery, small parts, etc. without taking their gloves off. But do they work for BMX? I took them to a Thursday night race at the local track to find out. How did they compare to the regular name-brand gloves that I usually wear? The gloves were very comfortable. They didn’t feel hot (despite the record temps that day) and were thin enough to give a great feel for the grip and lever. Fortunately, I didn’t have to test their ability to withstand a crash (because I kept it rubber side down that night) but I really got the sense it would take a lot to tear these gloves…they looked like they could stand up to a lot of abuse. In the looks department you can’t really go wrong either…the ones I tried kinda reminded me of old school Oakley gloves…and they’re available in just about any color or color combo you can think of. Matching them to your current gear definitely shouldn’t be a problem. Would I recommend them? Heck yeah. They stack up easily with any of the big-name gloves out there right now. And you can get them at most auto/hardware type stores at considerably lower price then you would pay for “riding-specific” gloves. If you’re in the market for gloves, Mechanix gloves are definitely worth checking out.